Cooper has been in preschool since August which means we’ve had ten million thousand gazillion germs enter our household. In this past six months I feel like we’ve been sick more than we haven’t been sick. Needless to say I’m ready for it to be over! I spied this recipe in the latest Bon Appetit and had to jump right on it. I suppose the word ELIXIR sealed the deal. I’m really hoping this helps keeps that pesky scratch in my throat at bay. 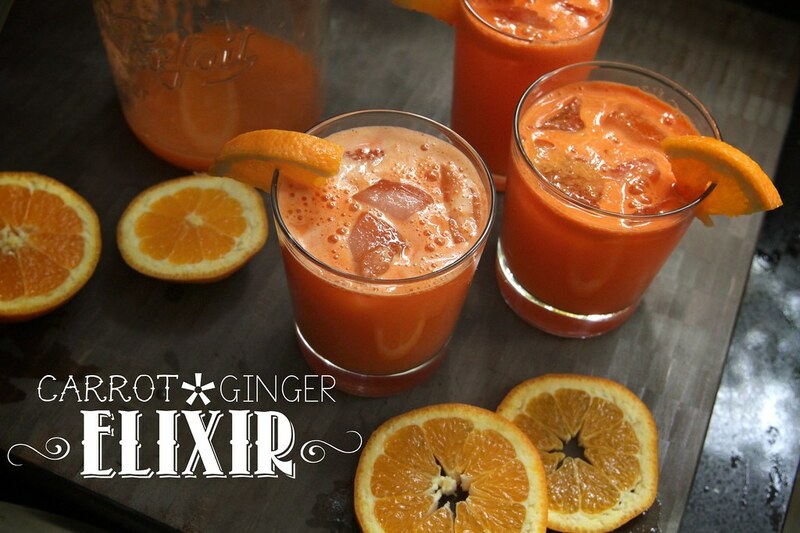 Ginger, lime & carrots, do your MAGIC. And if it doesn’t, I still have a tasty beverage to add to my repertoire. 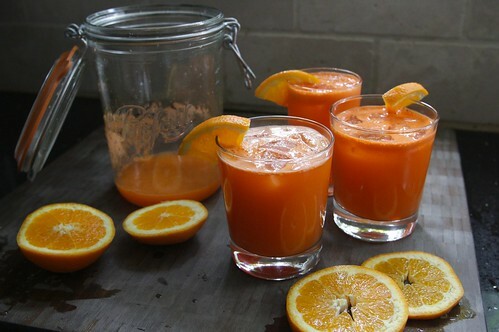 This carrot ginger elixir is spicy/sweet and will be soooo good in an afternoon cocktail this summer. I’d better be well by then! 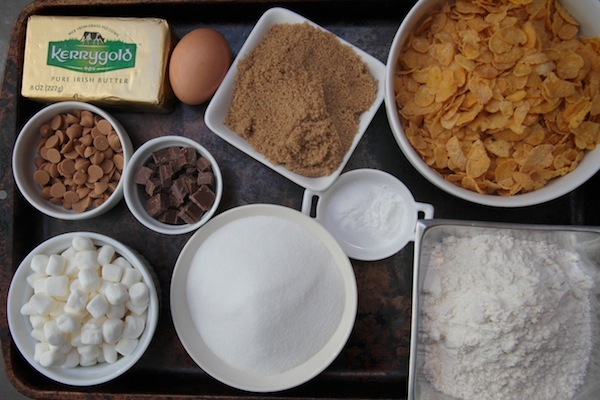 Get your ingredients together! We’re gonna make a ginger syrup first. Using the back of a spoon, peel the ginger. Then chop it up! 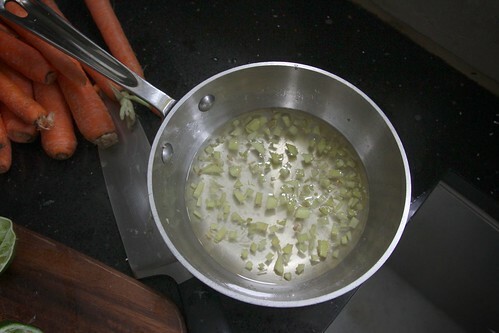 Place ginger in a small saucepan with the sugar & water. Heat it up! Now we juice the limes. I think it took me about 4 1/2 limes to get 1/2 cup juice. This is why we have the sugar syrup to balance out the ginger & lime potency. 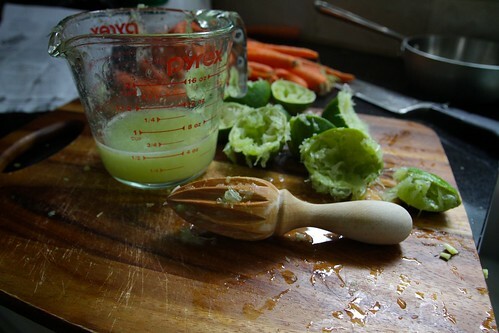 Strain the ginger syrup and mix it in with the lime juice. 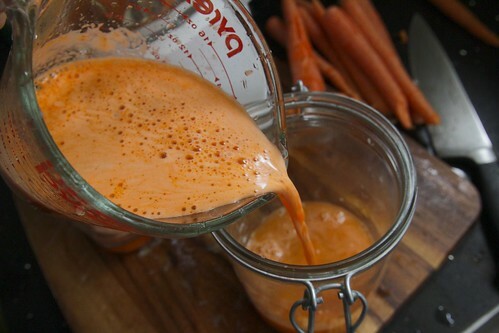 Now pour your carrot juice in the ginger/lime concoction. Stir! Pour the elixir into glasses with ice cubes. Add a little orange segment for pizzazz. Now top off each glass with a little ginger beer. It gives your elixir a subtle fizz. Let that elixir do its thang. 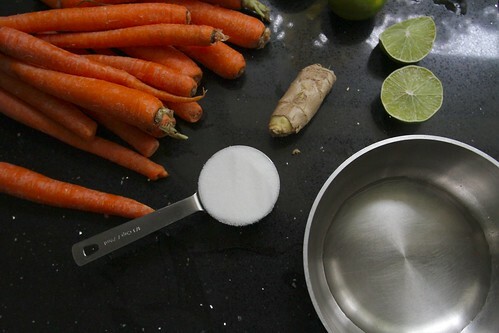 Bring sugar, ginger, and 1/3 cup water to a boil in a small saucepan, stirring until sugar dissolves. Remove from heat; let steep for 10 minutes. 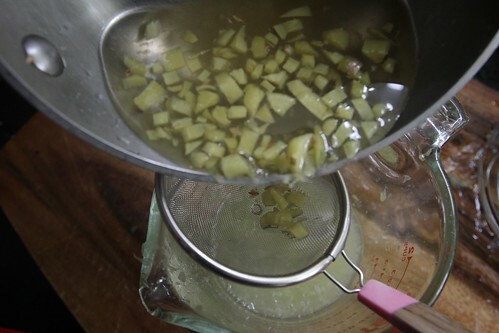 Strain through a fine-mesh sieve into a medium pitcher; discard ginger. Cover and chill syrup. Fill four 6-oz. glasses with ice cubes. 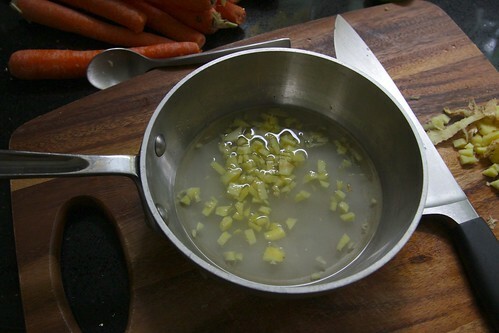 Add carrot juice and lime juice to ginger syrup in pitcher; stir well. Divide elixir among prepared glasses and top with ginger beer. Serve with a slice of orange on each rim. I’ll try this and see if it helps us stay healthier! 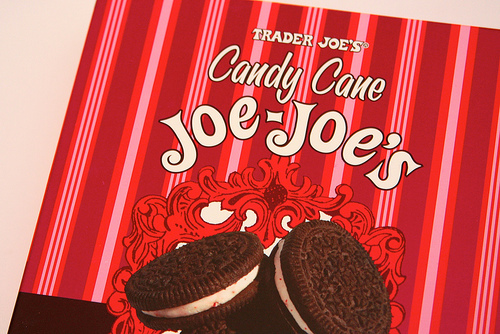 Looks delicious, I hope it does the trick and that you all feel better soon! Ahh I feel your pain! The first winter my daughter was in childcare we ALL got so so sick. She hasn’t been sick since (apart from a cold or 2). 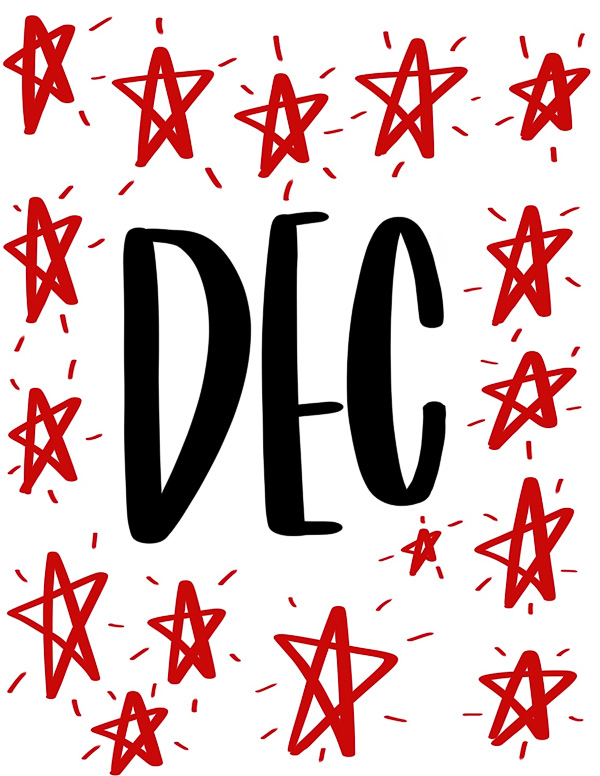 Unfortunately this will be my son’s first winter (southern hemisphere) and he has already had colds, tonsillitis, hand foot & mouth disease and conjunctivitis and its only March! This looks great, I can’t wait to try it. May it work its MAGIC and keep us all well! Oh lord…we’ve had conjunctivitis hit our house THREE TIMES. Not cool. Not cool at all. this looks AMAZING, gorgeous colours. i love that you love limes!! they are definitely my favourite citrus fruit. LOVE LOVE LOVE limes. 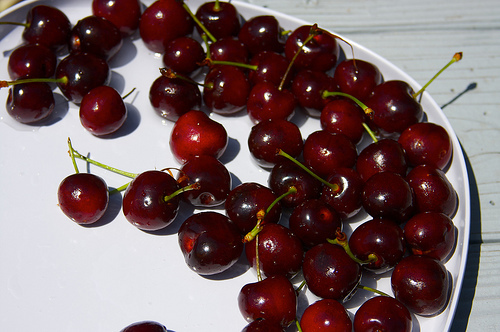 I like to squeeze them on top of cut apples. Have you tried that? It’s amazing. The word “elixir” definitely seals the deal. I’m healed already! 😉 But seriously, this sounds fantastic! Looks and sounds totally yummy. But… “using the back of a spoon, peel the ginger.” Whaaa?? I love your juice posts…and calling this an “elixer” just makes it even better! When I was a preschool teacher I was sick ALL THE TIME…kids are cute, yet grimy, it’s just a fact. You never got used to it? That’s not good! 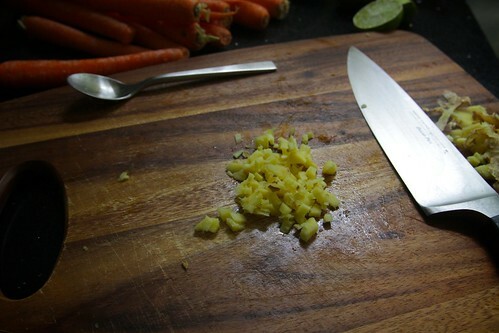 “Using the back of a spoon, peel the ginger. ” How do you do that? Ok, I’m now watching your link… thanks a lot! We are so on the same wavelength, lady! I went on a cooking rager this weekend and having made a jar of ginger syrup a few weeks ago, immediately made this and photographed it for a future post. 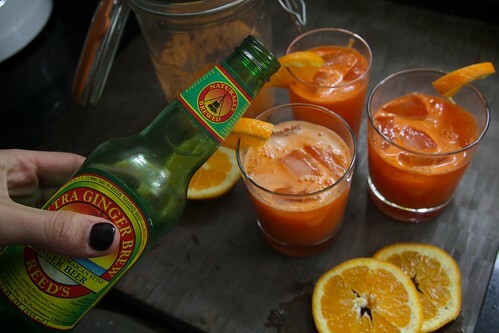 I love that you added ginger beer – I bet it cut the sweetness a little (my carrots were MAD sweet). I always love that bright orange color…Hope you are having a great week! Feel better soon!! 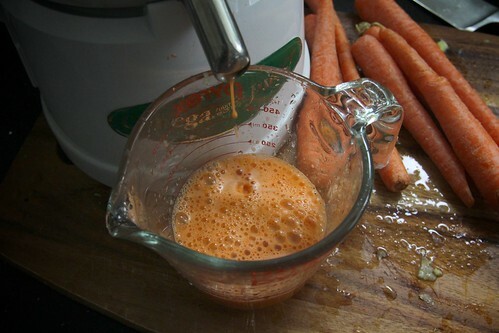 Good tip about the carrot juice for us juicer-less souls. True story: I honestly can’t remember the last time I had a cold (no kids around) which is ironic because I’ve been wanting to try your garlic/ginger/sriracha toast out on one. ha. I’m not going to wait for a cold for this juice, though! I bookmarked this recipe as soon as I saw it in Bon Appetit. 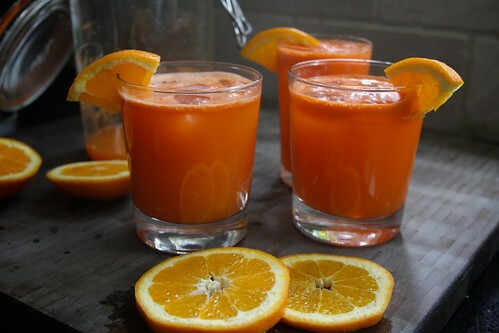 I love a good carrot-orange juice. Can’t wait to try this! i think i could drink this every day??? 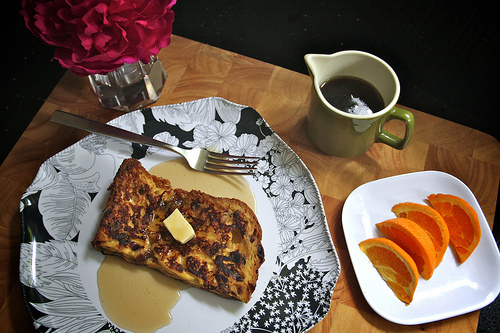 I like the sound of ginger syrup–I bet it would be super soothing in tea. And carrot juice plus zingy herbs definitely says spring to me! Little kids are germ magnets…hope you guys are feeling better soon! Just the colour makes you feel better and sparkling! Which juicer do you have? Would you recommend it? Thanks for sharing the tip on how to peel ginger! I needed that. I totally peel my finer the same way. Youtube rocks! I find the coolest tips on there, how to chop onions & de-stem kale! 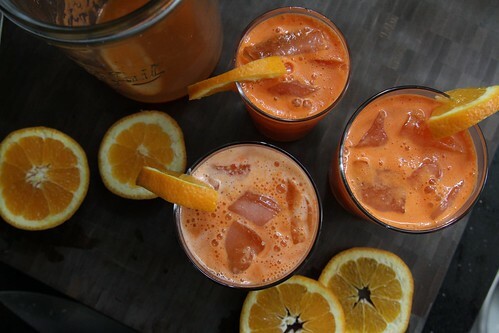 These carrot drinks look so pretty. I am digging the color! Where is your pin it button because I so want to pin these? Seriously, your fonts! I am SO in love with them! 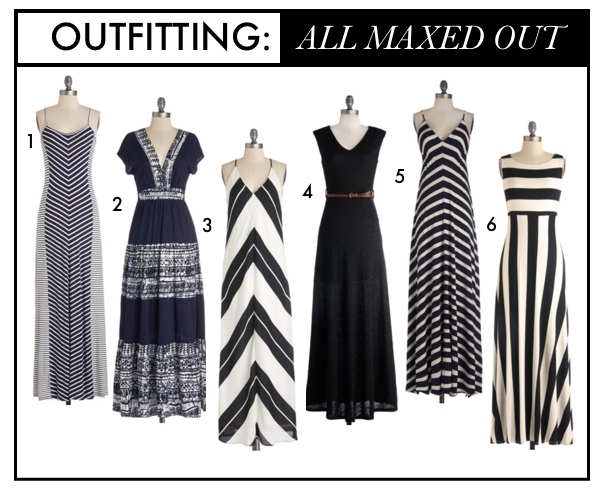 Sometimes I find myself perusing (did I just say perusing?!) your posts just to look at the fonts! Let’s not be silly here, your photos and recipes are still number one, but those fonts! LOVE! You must have quite the stock of them! Would love to know more! thaaaaaaaaaaaaaaaaanks. I studied graphic design in college and am finally putting what i learned to good use! I get a lot of them off of dafont.com I need to be better at managing them though! Definitely adding this to my week of soft serve! Love the color. Okay, I just have to tell you, in my dream last night I was talking to you about fonts at the gym. How weird is that?!?! 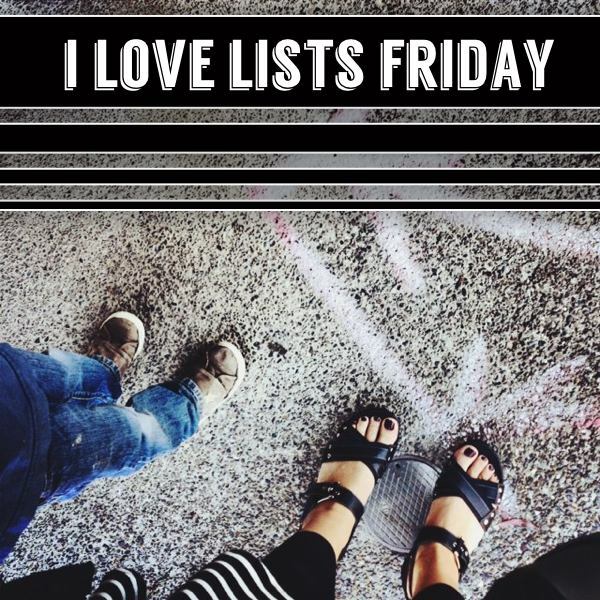 That’s some serious font love! Haha! Looks so Yummy!! I wonder how it was taste with a bit of spirulina in it!